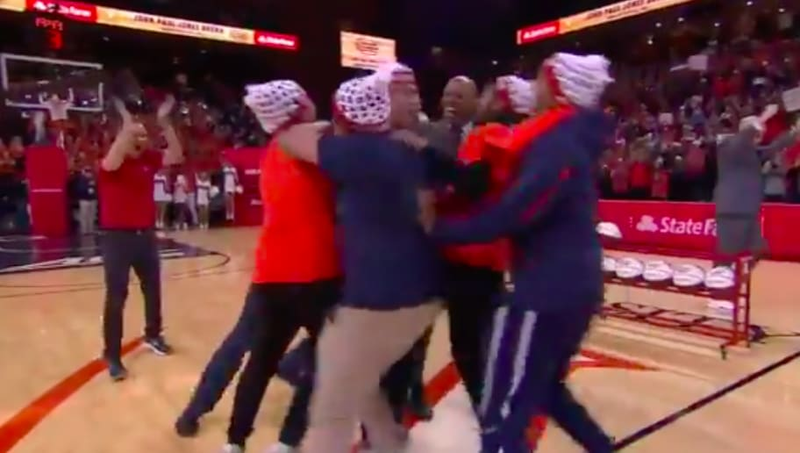 Duke may have beaten ​Virginia on Saturday, but UVA student Gabriel Simmons was clearly the biggest winner in Charlottesville, as he joined a bizarrely long list of Virginia students who have won some serious cash ($19,000) for sinking a half-court shot when ESPN's College GameDay comes to town. GameDay has gone to UVA 4 times ... and a student has been MONEY on the half-court shot in all 4! Simmons became the fourth Cavalier in four tries to take home the cash prize, following in the footsteps of 2018's Angus Binnie. ​​The finest performance in the history of this streak came in 2016, when Andrew Board needed only one attempt to send John Paul Jones Arena into a frenzy. ​​If only things could have gone as well on the hardwood for the Virginia men's team. The deadly freshman trio of ​Zion Williamson, RJ Barrett, and Cam Reddish reared its head once again to push No. 2 ​Duke past the Cavaliers for the second time this season. ​​Seeing your own team get crushed by the doomsday machine that is Duke has to be disheartening, but at least UVA fans weren't sent home totally empty handed thanks to Simmons.